You are here: Home > News > Two Wrongs Don’t Make A Right. A large portion of the Cathedral Quarter Conservation Area- Lower North Street, and Donegall Street is proposed for demolition. Including a number of unlisted historic buildings. Pre application deadline, Monday 3rd April at 5pm. A planning application for this area, including similar demolition extent, has previously been approved in 2012. This is due to expire this year. UAHS, and other heritage and cultural organisations opposed previous plans, and campaigned for their refusal as part of the ‘Let’s Get it Right’ campaign, 2011. Local businesses and arts groups have in response to new plans come together under ‘Save Cathedral Quarter’. UAHS reaffirms and upholds its objection to the previously approved and proposed plans. Since the approval of previous plans, much has changed. Belfast City Council has assumed responsibility for planning. Loss of historic buildings in the area has, since 2012, been rife, with the demolition of the Orpheus, the Metropole, and buildings at North Street, Union Street and Kent Street. A completely new application should be considered with this, the current context in mind. BH11: Development Affecting the Setting of a Listed Building. The guiding principles of PPS 6 lie in the protection of the historic environment through sympathetic and appropriate intervention for the re-use of our heritage assets. The development as proposed presents striking issues in relation to harm to the conservation area and inappropriate scale, height, massing, in the context of the conservation area and listed buildings. It is common in cities with a respect for and a sense of value in their historic buildings to strike a balance between economics and retention of inherent heritage value. The heritage-led regeneration of this area, is perfectly possible. Indeed it is an outcome that conservation area designation should imply. This can be achieved by centring the retail project, as appropriate, within already available vacant space, focusing on heritage-led regeneration of unlisted historic buildings, as complimentary to this. Re-use of historic buildings is an approach tested, and proven to enhance the Cathedral Conservation Area, and its social, cultural and economic draw. 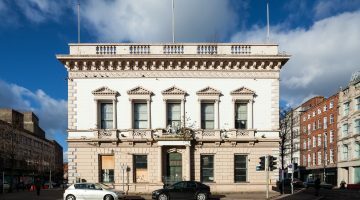 UAHS calls on the developer and their conservation architect to reconsider proposals before submitting any application to Belfast City Council. Follow Save Cathedral Quarter, www.savecq.wordpress.com, #savecq.